Whether it’s getting slack with snacks, taking extra advantage of takeaway, or simply grazing through the day, the time has come to get your meal time routine back (without resistance). When it comes to the juggling act of the back to school routine, mastering mealtimes can feel like one thing too many. So, make things easier on yourself by streamlining your mornings. Prepare school lunches the night before by putting together sandwiches and pre-cutting snackable veggies while dinner’s in the oven. Spend Sunday afternoons making double batches of your favourite munchies (think muesli bars, slices, bliss balls) – and have them stored in the fridge ready to be packed into lunch boxes as needed. Pre-pack school bags every evening and instil a morning routine checklist for the kids to tick off: breakfast, get dressed, brush teeth and out the door. All of this will help to make mornings easy and breezy. Better still, finding ways to get the kiddies involved, especially in the mealtime prep may not help get the job done quicker, but will help turn a [at times] mundane routine into a fun ritual. However, for some the idea of letting the kids loose in the kitchen can be nerve wracking. Not to mention the potential dangers and mess involved. 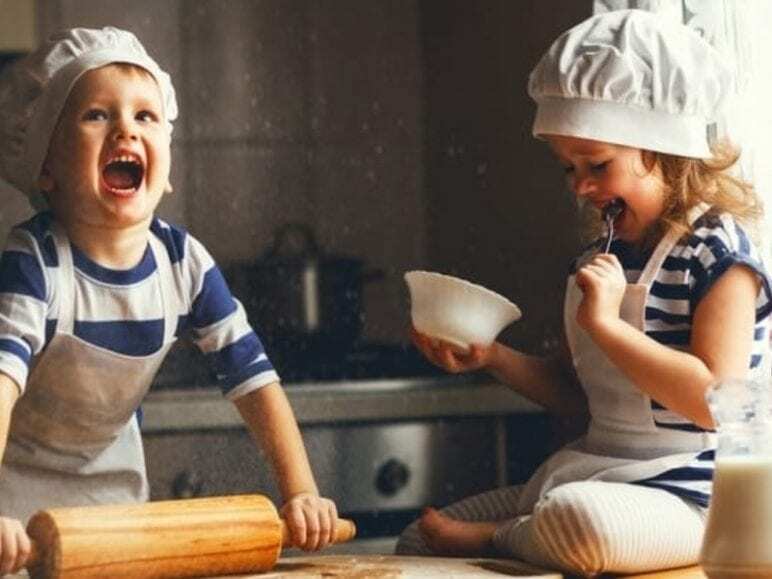 Here are seven simple tips for cooking with kids. Take them grocery shopping. Give them the freedom to pick out a new fruit, vegetable or meat to try with dinner tonight. You can let the occasional packet of chips sneak in the trolley, but the idea is showing them how to follow a pre-written ingredients list to help keep them keep on track and off the junk food. 2. Look through cookbooks together. Have them choose a few recipes that they would like to try cooking. Start off with simple recipes with fewer steps. A smoothie or juice or adding pizza toppings is an ideal starting place. As they become more experienced in the kitchen you can start introducing more complex recipes. Assign age-appropriate tasks in the kitchen. You’d be surprised how much they can assist with. Think measuring ingredients, pressing the button on the food processor or being in charge of the kitchen timer. At best, these cooking methods are applying math and science in every day life. 4. Taste everything together. Talk to them about the colours, textures and flavours of ingredients. Then show them how they’ve changed after being cooked. Provide the kids with their own special tools. This way, anytime they go into the kitchen, they can have their own special mixing spoon to use or their own set of colourful measuring cups. 6. Start a little garden. It doesn’t have to be a full herb garden. Try just a small basil plant that your child nurtures and then uses the leaves to make homemade pesto. Be patient. Yes, it’s probably quicker if you do it yourself, but the more you cook with kids, the faster they will be. Just factor in extra prep time and soon you’ll find that the more you cook with your kids, the less extra time you’ll need.